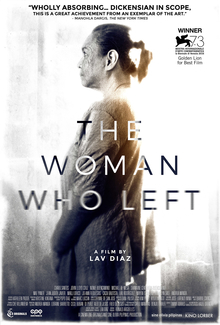 The Woman Who Left (Filipino: Ang Babaeng Humayo) is a 2016 Philippine drama film written, produced, edited, and directed by Lav Diaz. Filmed entirely in black-and-white, it was selected to compete in the main competition section at the 73rd Venice International Film Festival where it won the Golden Lion. Although it has received a very limited release, the film has received nearly universal acclaim from critics. The Woman Who Left was the first film made by Charo Santos-Concio when she returned to acting after stepping down as President and CEO of ABS-CBN Corporation. Horacia Somorostro (Charo Santos-Concio) was released in 1997 after being imprisoned for a crime she did not commit. Although Somorostro reunites with her daughter, she learns that her husband is now deceased and her son is missing. She realized that a thing remains unchanged - the power and privilege of the elite. This belief is cemented when Somorostro later found out that her former rich lover, Rodrigo Trinidad was the one who framed her for a crime. She learns that Trinidad is forced to stay within his house like his friends due to kidnapping incidents targeting the rich. To the ruling class, the kidnappings are the most serious problem in the country's history. Somorostro begins to plot her revenge amidst the crisis. The Woman Who Left was directed by Lav Diaz, who was also the film's editor and cinematographer. It was produced by Sine Olivia and Cinema One Originals with the latter's head Ronald Arguelles being the film's executive producer. According to Diaz the film was made not for a film festival. The film was planned to have a duration of four hours and by June 2016, the film was already in the editing process. The film was primarily shot in Calapan, Oriental Mindoro, the Philippines which is the hometown of lead actress, Charo Santos-Concio. According to Diaz, the film was inspired by the short story "God Sees the Truth, But Waits" by Leo Tolstoy. Diaz, reflecting on the story and how it relates to his work, said that life is not truly understood by anyone and that more often people "abide and succumb to life's randomness." Charo Santos-Concio, the lead actress described the film as "a story of forgiveness, of transcendence." While the film was not made for a particular film festival, director Diaz is open to the idea of screening The Woman Who Left in film festivals. In June 2016, it was reported that talks were ongoing for the film to be screened locally in the Philippines and overseas. There were also talks for the film to be screened at the 2016 Metro Manila Film Festival. The Woman Who Left was screened at the 73rd Venice International Film Festival held in September 2016 as the lone entry produced entirely by an Asian production film company. The 2016 Venice Film Festival marks the third time director Lav Diaz has entered a work at the film festival. The Woman Who Left will also be screened at the 2016 Cinema One Originals Film Festival. The film's local commercial theatrical release was initially set in 23 September 2016 to run for at least a week so it could be eligible to be submitted as a Philippine entry for the Best Foreign Language Film award at the 89th Academy Awards. The playdate of The Woman Who Left was moved to 28 September 2016 after Ma' Rosa was selected as the Philippine submission for the award instead. On the review aggregator website Rotten Tomatoes, The Woman Who Left holds an approval rating of 79% based on 19 reviews, and an average rating of 7.3/10. On Metacritic, the film has a weighted average score of 83 out of 100, based on 10 critics, indicating "universal acclaim". ^ Lodge, Guy (9 September 2016). "Film Review: The Woman Who Left". Variety. Retrieved 15 April 2017. ^ a b Tartaglione, Nancy (28 July 2016). "Venice Film Festival: Lido To Launch Pics From Ford, Gibson, Malick & More As Awards Season Starts To Buzz – Full List". Deadline. Retrieved 28 July 2016. ^ a b c "Charo Santos' film comeback "Ang Babaeng Humayo" to be screened at the 2016 Venice Film Festival". ABS-CBN Entertainment. ABS-CBN Corporation Communications. 28 July 2016. Retrieved 28 July 2016. ^ a b San Diego, Bayani Jr. (2 June 2016). "For the Lav of Charo". Philippine Daily Inquirer. Retrieved 28 July 2016. ^ San Diego, Bayani Jr. (28 July 2016). "Lav Diaz film starring Charo Santos competes in Venice". Philippine Daily Inquirer. Retrieved 28 July 2016. ^ Villano, Alexa (30 May 2016). "Charo Santos-Concio returns to acting in upcoming Lav Diaz film". Rappler. Retrieved 28 July 2016. ^ Sallan, Edwin (19 September 2016). "'Ang Babaeng Humayo' moves playdate to September 28". InterAksyon.com. Retrieved 20 September 2016. ^ "The Woman Who Left (Ang babaeng humayo) 2017". Rotten Tomatoes. Fandango Media. Retrieved 10 March 2018. ^ "The Woman Who Left Reviews". Metacritic. CBS Interactive. Retrieved 10 March 2018. This page was last edited on 1 October 2018, at 00:18 (UTC).